The House has seen a transgender person testify on the issue of transgender rights in employment, but for the first time ever, the Senate will hear from a transgender witness, speaking about ENDA, the Employment Non Discrimination Act. The Employment Non Discrimination Act, when passed, would protect Americans from employment discrimination based on sexual orientation or gender identity by civilian, nonreligious employers with at least 15 employees. President Obama supports the bill, which was first introduced in 1994 and has failed to succeed in the 18 years since. 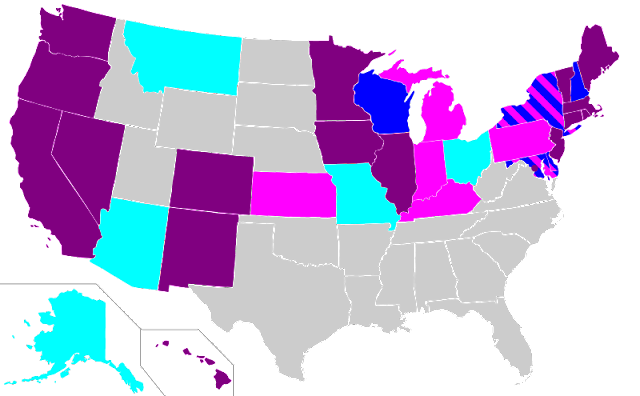 English: U.S. LGBT employment discrimination law. Date November 24, 2011 (UTC) Source en:US LGBT civil rights August 2008.png + updates.